Good old Mr Wallace. 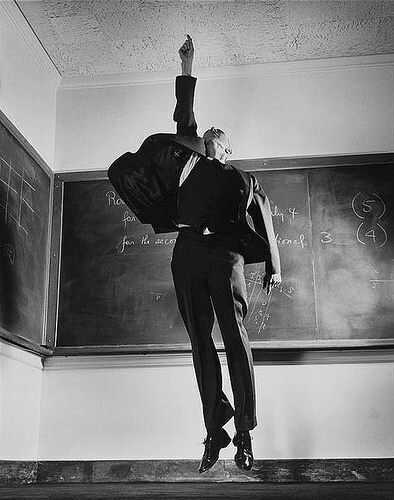 He was such an enthusiastic teacher he constantly wanted to be the first to answer his own questions. That is one strong spider web. "Do you think we ought to take the nail out of his finger now?" How many professors does it take to screw in an invisible lightbulb?" Right kids. Today we will be learning all about simultaneous equations...through the medium of interpretive dance! Another teacher falls for the old superglue on the ceiling trick. It's almost as if he was cut and pasted from the previous photo. The high point of his day. oh. I appear to be stuck." "Bloody kids, they usually put chewing gum under the desks." The discovery of hydrogen was a memorable moment. Sir, what else is wrong with classical physics? Note this down children, good quality ecstasy plus a 90s rave tape = Mr Simpson on one. Mr Harris has clearly been listening to a little too much S Club 7. "..and then you do a forward enrol." ♪ "Vertigoooo, will you send back...a lecture from America..."
I've always wondered what teachers get up to on insect day.